Daisy Ashcroft and Niamh Stroud collected thousands of batteries. 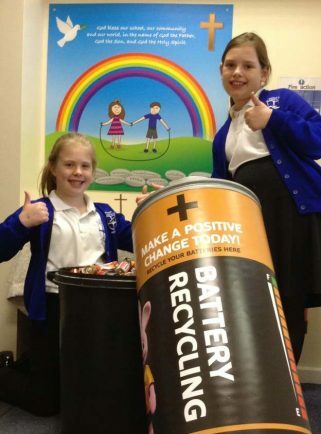 PUPILS at Studley St Mary’s CE Academy, have embarked on a plan to help make a positive change by collecting batteries which will be sent off for recycling as part of ‘The Big Battery Hunt’. The pupils were challenged to collect batteries over the Easter holidays and in three weeks collected more than 15,000! Two Year 5 pupils brought in 4,000 batteries between them. Daisy Ashcroft and Niamh Stroud aged 10 are positively supercharged to have taken part in the initiative. “We have been totally amazed by the commitment the pupils have to saving their planet and they have exceeded all expectations!” Wendy Williams, Science Lead.